Sports Rendezvous: WATCH: Quinton de Kock pleased as Proteas finally pass trial by spin. WATCH: Quinton de Kock pleased as Proteas finally pass trial by spin. 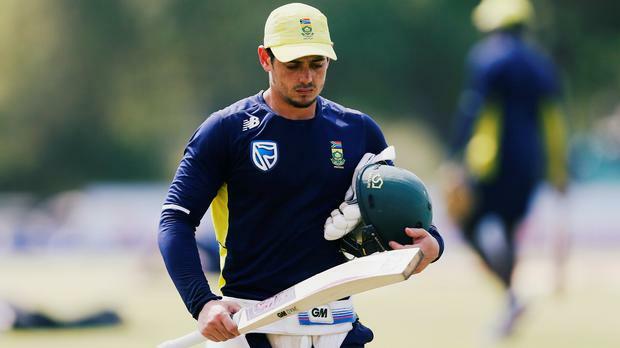 DAMBULLA, Sri Lanka – Quinton de Kock has rediscovered his form as South Africa went 2-0 up in the one-day international series in Dambulla, Sri Lanka on Wednesday, and now he's hoping for a 5-0 scoreline. A sequence of 3, 10, 32 and 8 in the two Tests didn’t make for happy reading for De Kock, but with South Africa totalling 126, 73, 124 and 290, his failures didn’t stand out too much. But 47 in 59 balls and 87 in 78 in two successful chases in the ODIs have made him feel slightly better about himself. “Obviously I am feeling more satisfied than I was in the Test matches, it was quite tough then,” he said after his knock from the top of the order helped South Africa win the second ODI by four wickets and earned him a Player of the Match award. “Coming now into white ball, change of format, starting to add some value to the team is always nice. It’s great also to be on the winning side in Sri Lanka, so all things are good at the moment.